(8.5) The title refers to the children of Hattie and August. They met in Philadelphia having both grown up in Georgia. The city held promise of escape from the treatment in the south and hope for a brighter future. When Hattie falls pregnant at 17, August does the honourable thing and marries her. Their twins Philadelphia and Georgia are born in 1925. Each chapter is named after their successive children and moves the story forward by any number of years. The reader learns about each child at different times in their lives. The marriage is not a happy one. August takes to night-time drinking, gambling and womanizing leaving Hattie to care for the ever growing family. Hattie is care-worn and bitter but determined to do her best by her children. This comes across as a very authentic tale and the structural device allows the author to evoke a number of different scenarios of growing up in an African-American family during the 20th century. This book really struck a chord with me. This would be a good choice for a book club, there is much fodder for discussion: analyzing all the characters motives, the roots of everyone’s unhappiness, the historical significance of The Great Migration, etc. I just wish it had been a continuous narrative instead of split into a series of vignettes told from different points of view. Although I thought this was very well-written and it evoked strong emotions, I didn’t think the voices were distinct enough. I look forward eagerly to the next offering from this author. The Twelve Tribes of Hattie attempts to show the warping of the dreams of black Americans who hoped to find a better life in the urban North. This means not only must it bear the pressure of Ms. [Oprah] Winfrey's endorsement, but must also withstand comparisons to two of the epochoal works of American fiction, Ralph Ellison's Invisible Man and Toni Morrison's linked trilogy Beloved, Jazz and Paradise (to say nothing of William Attaway's equally brilliant but underappreciated Blood on the Forge). Few debuts could survive this kind of scrutiny, and Ms. [Ayana] Mathis's doesn't come close. The numerous strands of the plot only sporadically and arbitrarily connect to one another, and Ms. Mathis lacks the skills that a more seasoned author might have to impose a narrative authority on them. Ms. Mathis has a remarkable ability, however, to inject the most agonizing events with a racking sense of verisimilitude. The chapter in which Hattie desperately tries to keep her ailing twins alive (staying up with them for three nights in a row, making mustard poultices, walking in circles with them in her arms in a steam-filled bathroom) and the one in which she makes the agonizing decision to let her well-to-do sister in Georgia adopt her last child, Ella, in order to give the baby a better life, have an excruciating intimacy that makes us feel we are reliving events in our own families’ lives. cities we will come to." you, one from each tribe. she could never invent them. "Philadelphia and Jubilee!" August said when Hattie told him what she wanted to name their twins. Hattie put her arm around Sala and pulled her close; she patted her grandmother's back roughly, unaccustomed as she was to tenderness. Information from the Catalan Common Knowledge. Edit to localize it to your language. In 1923, fifteen-year-old Hattie Shepherd flees Georgia and settles in Philadelphia, hoping for a chance at a better life. Instead, she marries a man who will bring her nothing but disappointment and watches helplessly as her firstborn twins succumb to an illness a few pennies could have prevented. Hattie gives birth to nine more children whom she raises with grit and mettle and not an ounce of the tenderness they crave. She vows to prepare them for the calamitous difficulty they are sure to face in their later lives, to meet a world that will not love them, a world that will not be kind. Captured here in twelve narrative threads, their lives tell the story of a mother's monumental courage and the journey of a nation. 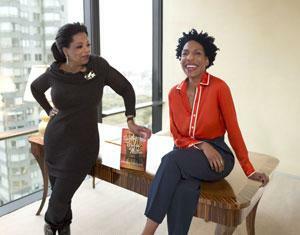 Oprah with Ayana Mathis, author of Book Club 2.0's December 2012 selection, The Twelve Tribes of Hattie. Q. Describe Oprah's Book Club 2.0® in one sentence (or, better yet, in 10 words). A. An impassioned and powerful declaration: Books matter. Q. What's on your bedside table or Kindle? A. I'm often reading three or four things at a time, so I invent odd categories to keep them straight. The bedside table is home to read before-bed-but-not-on-the-subway books (heavy hardcovers like Hilary Mantel's Bring Up the Bodies), mysteries/thrillers (like Robert Wilson's A Small Death in Lisbon) and things I ought to read but are slooow going (I am now on my fifth month with Augustine's The City of God). Q. Top three to five favorite books of all time? A.Very hard to answer! Beloved by Toni Morrison; The Known World by Edward P. Jones; Housekeeping by Marilynne Robinson; The Sound and the Fury by William Faulkner; Cane by Jean Toomer. Q. Important book you never read? A. Ulysses. And also Portrait of a Lady, which shames me. Q. Book that changed your life (or book that made you want to become a writer)? A. I wrote throughout my childhood and thought I wanted to be a poet, but that was more a fantasy than a goal. I was 15 when someone gave me Sonia Sanchez's, I've Been a Woman—that book was a revolution in my life. I realized that I actually could be a poet, that there were black women who were writing--right then, in that moment. A. This one? I'm so new to being an author (distinctly different from the solitary enterprise of being a writer) that every moment is unforgettable and stunning. Q. What talent or superpower would you like to have (not including flight or invisibility)? A. Anything Wonder Woman can do! Roping bad guys with a lasso of truth, deflecting bullets with my bracelets! Of course, I'd trade all of that for mindreading. Q. What are you currently stressed about or psyched about? A. I'm psyched about writing some essays on the nature of faith and belief. Writing essays is a very different process from writing fiction. I'm having a hard time with them, which is incredibly exhilarating and incredibly stressful. Q. What's your most treasured possession? A. My grandfather's diaries. He kept them secretly for over fifty years and gave them to me a few years before he died. Q. Pen envy--book you wish you'd written? A. Rita Dove's Thomas and Beulah or Yusef Komunyakaa's Magic City. Q. Who's your current author crush? A. Eudora Welty. There's never a wasted word in her short stories; so much power and meaning packed into a few short pages. Q. What's your favorite method of procrastination? Temptation? Vice? A. That's an embarrassingly long list: clothes shopping online, returning clothes I've bought online, cooking elaborate time-consuming dinners, farmer's markets, Netflix Instant (grrr, it's ruining my life). Q. What do you collect? Q. Best piece of fan mail you ever got? A. Oh dear. I've never gotten any. I'm feeling a little inadequate now. Q. What's next for you? A. Trying to find a way into my second novel, the idea is there but the rest isn't. Right now it's a bit like stumbling around in a dark room. The story of an African American family held together with a mother's grit and monumental courage.